The reminiscences of an acerbic writer reflecting on his life and loves while awaiting either medical aid or death in Africa, The Snows Of Kilimanjaro is an introspective journey that gradually but surely gathers inner strength. 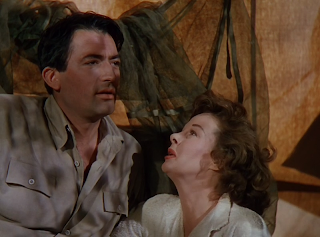 Writer and amateur big game hunter Harry Street (Gregory Peck) has a badly infected leg at the base of Mount Kilimanjaro in Africa. Helpless on his back and almost delirious with pain, Harry is nevertheless self-obsessed and churlish. He verbally spars with his companion and caregiver Helen (Susan Hayward), before slipping into remembrances of his life's key moments. 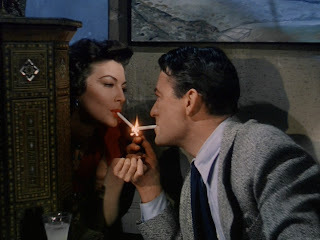 Aspiring to be a writer since he was a young man, and always attracted to a life of travel and adventure, Harry meets Cynthia Green (Ava Gardner) in Paris. She becomes the love of his life, and joins him on a game hunting expedition in Africa. But when Cynthia finds out that she is pregnant, she longs for a stable life of domesticity, but realizes that Harry only ever wants to travel and pursue new experiences as inspiration for his writing. They part ways under difficult circumstances in Spain. Harry has further romances with a domineering Countess (Hildegard Knef) and then meets Helen, but Cynthia never fully leaves his heart, and they are fated to meet again. The Casey Robinson script keeps the spirit of Ernest Hemingway's semi-autobiographical short story, but changes many essential elements, including introducing the crucial character of Cynthia Green and altering the ending. The film becomes primarily an ode to essential love lost as seen through Hemingway's caustic lens on life. The Snows Of Kilimanjaro does have to struggle against an unsympathetic central character. Harry Street is not exactly easy to like, almost outright mean to Helen, who happens to be the only friend he has as the buzzards circle over his immobile body and rotting leg. And as the memories reveal more about Harry, he proves to be deaf to Cynthia's needs, narcissistic in pursuing his own agenda, oblivious to the feelings of others, and quick to mock those closest to him. But gradually, a sympathetic man emerges, finally coming to terms with what matters in life and pursuing more noble pursuits, including a war against creeping oppression and a final, desperate attempt to revive the core relationship of his life. The surprising power of the movie comes from the gathering strength of Street's character, as he evolves into a man slow to recognize the signposts of life, but ultimately following them, albeit possibly too late. Henry King directs in lush colour, The Snows Of Kilimanjaro enjoying grand visual depth and plenty of stock footage of the African wilds, as well as European scenes in Paris and Madrid that are alternately impressive and melancholy. Harry's first meeting with Cynthia in Paris is a magical encounter of mood, music, movement and mirth, brought together by the magnetism of a love meant to spark over a common cigarette lighter. In other scenes King mixes the authenticity of a writer's free spirit with the competing demands of compromise to thrive in life, a contest in which Street often performed poorly. Peck does well in a role against type, Harry on the opposite side of the street from the upstanding heroes often embodied by Peck. Gardner gives an assured performance as a vulnerable Cynthia, a woman a couple of steps ahead of her man in understanding life but not willing to ruin his rush to boyish adventurism. By comparison, Hayward has relatively little to do, as Helen is consigned to fending off Harry's pessimistic jabs, unwilling to fight back against an already stricken man. Leo G. Carroll has a typically small but important role as Harry's uncle. The Snows Of Kilimanjaro is a thoughtfully slow exploration of an error-filled life. As in big game hunting, knowing when to take a shot and when to back away comes naturally for some, but is a lifelong pursuit for others.